No Soliciting…. Again… and Again…. 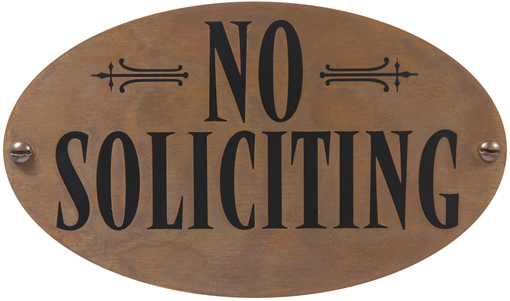 When you enter our neighborhood there is a “No Soliciting” sign. It doesn’t work. Beyond the neighborhood kids selling things for school fundraisers, which, by the way, don’t count, we have people come to our door who have tried to sell me magazines, books, security systems, religion, meat and candy. It is not so bad if you are craving chocolate and someone steps on your doorstep selling M&M’s. That’s more like a miracle. However, it becomes annoying when you really don’t want the truck load of meat at a bargain price. At our house, when we experience someone selling at our door, we point them to the neighbor across the street and say, “She usually buys things. You might want to check with her.” Actually, she is the neighbor who gets so angry with them that she will call the police or at least threaten it. Okay, we don’t really send them her way, but when the seller interrupts something, the thought does occur. It is not that I don’t want to help them, it is just I don’t like feeling like prey and so often that is the feeling. 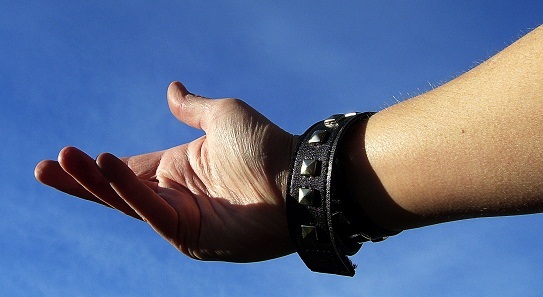 However, soliciting doesn’t always involve a transaction of goods. It can just be about asking for money. It is not only at home and work that this “prey” feeling is often rendered, but I have been approached in public shopping areas by people with the same stories and asking for money. I have been alone, with my husband, with my children, my co-workers and even with my mother when approached and again, the stories are all very similar. I have had several just ask for $6 or $7 dollars and numerous ones have offered their cell phone as collateral of sorts. There has not ever been an expensive cell phone offered but rather a pay as you go inexpensive one. Regardless of the approach, stories and offers, so many are so close in nature that, again, they seem fabricated. Also, in my line of work, people stop by or call our office often asking for financial help. Each story is usually different, but oddly close enough in circumstance that it is easy to become desensitized. It is not that I think each one is telling a false story, but when you hear the same story over and over, you begin to wonder how they all have experienced the same thing and what is real. Naturally, we treat each story as if they are true, but also have a plan to help them get the help they need though valid resources and not so much us. Now you know where my cynicism about these situations was born, but there is more; enter young lady. Several years ago, after dark, a young lady approached me in a store parking lot. She was appropriately dressed for the weather, but it was cold, rainy so I had her follow me to the store door. There was something about her that was a little different than the typical person who had asked me for help in the past. She told me she was from a town in the region and was in town and ended up with a flat tire and didn’t have the money to get it fixed. She gave great detail to her story which made me skeptical (yes, skeptical) but I decided to help her anyway. I gave her $20. She thanked me and left. I’m not sure if she asked others after me or not, but after I gave her the money, I just hoped it was legitimate. I didn’t think anything about the situation again until one day while I was getting something inside a convenience store, my teenage daughter, who was waiting in the car, was approached. When I returned to the car, as my daughter was telling me the story, a young lady approached my side of the car. I quickly recognized her mannerisms and her look and I knew it was the same girl. Her story was the same… in need of a new tire… mother-in-law and son are at the car… she had priced tires and was short 40 dollars… she had a cell phone she could give me…. I remember thinking that she probably had more money than me and that I should ask her for money… I don’t remember what I said exactly to her but I do remember that, though a bit out of character for me, I was miffed and didn’t help her. I later shared my reunion story on Facebook with pride as I told of my refusal to help. Several comments made me begin to think about my treatment of this young lady. Had I been too rude? Had I shown love? Had I helped her in any way? I thought that what I had done was the right thing and maybe not giving her money was the right thing but I didn’t handle it with care. Having been made highly aware of the ignorance of human trafficking, I began wondering….What if she was trapped in a lifestyle that she felt she deserved. What if she was at one time a runaway. What if she had been sold to someone and was working for them. I really wish I done and said things differently. Fast forward about 18 months to the other day. I was in a parking lot looking for a place to park when someone flagged me down. When I saw her face, I knew at that very moment it was the same young lady. When she approached my car she began telling me the same story… she mentioned a flat tire, a child, offered me a cell phone… It was then that I decided to really talk to her. My first question to her was, “Are you okay?” She looked at me and answered, “Yes, ma’am.” Then I asked her, “Are you doing this for someone else?” She said, “No ma’am”. I asked her, “Are you safe?” She nodded. I then said, “The reason that I ask you this is because this is not the first time we’ve met.” She was speechless. I continued, ” You have approached me before and told me the same story.’ She apologized with an, “I am so sorry.” I also told her that I didn’t have money to help her but I was concerned that she was not in a safe place. With a confused look, she again apologized, said, “God bless you” and walked away. A part of me was pretty excited that I had the opportunity to meet her again. I could hardly wait to tell my family. However, in the reeling of my pride, that still small voice spoke and said, “You didn’t tell her that I love her.” He’s right. She may have walked away thinking that someone “caught” her. She may have walked away thinking that was a close call. Still yet, she may have walked away thinking that someone actually did care about her, but she didn’t walk away knowing what prompted me to ask her. She didn’t walk away knowing that God loves her right where she is. She didn’t walk away knowing that her Creator made her and loves his creation. Maybe I’ll get another chance. In the meantime, if you see her, don’t forget to tell her.